A group of children walking to or from school with one or more adults supervising. These adults are volunteers and essential to the operation of the programme. Joining the Walking School Bus is a great way for your children to get some exercise and is an excellent way to teach them important road safe practices. As an added bonus is an environmentally friendly alternative to driving reducing vehicle congestion around our school. Which bus is for you? At Point View School we have successfully been running buses since 2007. We have one route based around Kilkenny Drive (see the map under the Information and Registration page). How does my child join one of the buses? Go to the Information and Registration page, select the link the bus you want your child to take and complete the registration details. Once registered you will receive a roster and contact list. All children are given a high visibility fluoro jacket to wear for safety purposes. Without volunteer helpers the Walking School Buses cannot operate. On the registration form there is a place for you to indicate which days and sessions you can help with. You do not need to volunteer for every session, but we will appreciate whatever time you can give. The average time commitment is 30 minutes per journey. We would love you to join us. 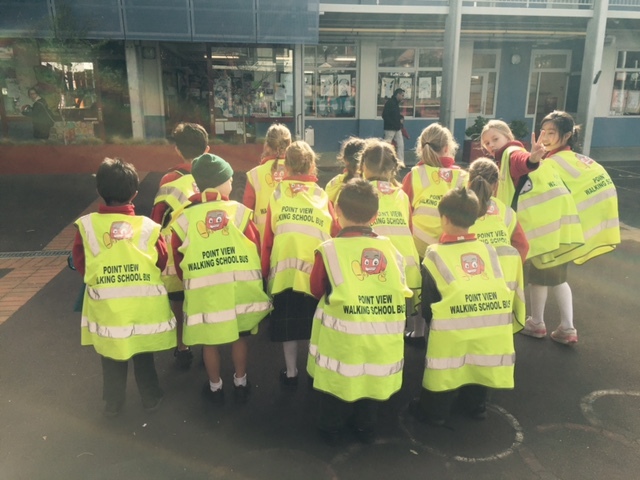 We are a Travelwise school, working with Auckland Transport on a three year project aimed at improving road and pedestrian safety around our school. Traffic Engineers develop a plan, in conjunction with the school, and fund key changes to local roads, footpaths and signage. This project also includes regular promotional activities.